While some opt to use their TriStar vacuum without bags, most people prefer the more sanitary and hassle-free handling of disposable paper bags. Using a paper bag also increases the life of the cloth filter bag and other filters in the vacuum. Using paper bags in conjunction with the cloth bag also results in significantly better filtration which, in turn, provides longer motor life. Those effected by allergies or asthma can benefit greatly from this system, pet-owners can and have testified to the advantages. Tristar states that using bags other than "Tristar" replacement paper bags may interfere with proper airflow, which can cause serious damage to your vacuum. Genuine Tristar Bags will feature the "Tristar" logo printed on each bag. If you use your vacuum about once a week, TriStar recommends replacing the paper bag at least once a month, and more often if necessary to ensure optimum performance. Additionally, TriStar suggests changing the motor filter annually and the after-filter with every 6 paper bags changes. Replacing bags and filters regularly keeps filtering and airflow running well and reduces the chance of overheating. EnviroCare Micro Filtration Paper Vacuum Bags for Compact / Tri Star Canister Model Vacuum Cleaners. 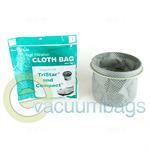 Cloth Vacuum Bag with Ring for Compact / TriStar Canister Vacuums. 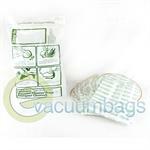 Generic DVC Paper Vacuum Bags for Compact / TriStar Canister Vacuum Cleaners. 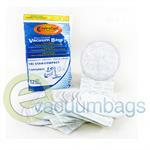 Genuine EnviroCare Paper Vacuum Bags for Compact / TriStar Canister Model Vacuums. 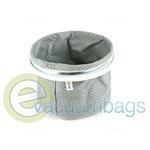 Generic DVC Cloth Vacuum Bag for all Compact / TriStar Canister Series Model Vacuum Cleaners. 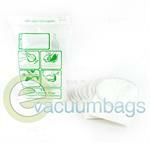 Generic DVC Paper Vacuum Bags for Compact / TriStar Vacuum Cleaners. 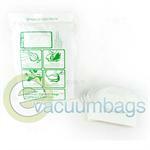 Generic EnviroCare Single Wall Paper Vacuum Bags for Compact / TriStar Canister Vacuums.